SOUL FOOD & Gospel Concert Brunch! JPOP CAFÉ, in Shibuya on April 21st, 2013. Doors will open at 1:00 pm food and performances from 1:30 pm – 3:30 pm. 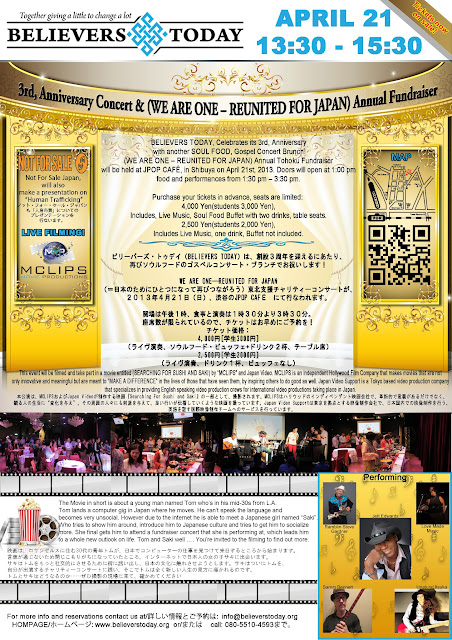 This event will be to be filmed and take part in a movie entitled (SEARCHING FOR SUSHI AND SAKI) by “MCLIPS” and Japan Video. MCLIPS is an Independent Hollywood Film Company that makes movies that are not only innovative and meaningful but are meant to “MAKE A DIFFERENCE” in the lives of those that have seen them, by inspiring others to do good as well. Japan Video Support is a Tokyo based video production company that specializes in providing English speaking video production crews for international video productions taking place in Japan. The Film "Searching for Sushi and Saki" is about Tom, an American thirty-something who has recently moved to Tokyo from LA for what he thinks is just a temporary gig, struggles with feelings of isolation in a land where he doesn’t speak the language and all of his relationships are online. He’s self-absorbed and pretends to be a cooler version of himself on the ‘net. Then he meets Saki, a free-spirited Japanese woman who teaches him about Tokyo and relating to others in a more personal way. She tries to help him live in the present and communicate with words, not with texts and email. She gets him to attend a fundraiser concert that she is performing at, which leads him to a whole new outlook on life. well ……. You’re invited to the filming to find out more. Click the picture to follow the link to the event's Facebook page!